Find all Luxury Yachts here. Lumiere’s exterior and interior design is the work of Stefano Natucci and she is able to welcome up to 12 guests in six cabins. Accommodation for guests counts the master suite, a VIP, two doubles and two twins, all ensuite. The master cabin is in prime position in the main deck and has features including a Jacuzzi bath in the ensuite and panoramic views across the water. All guest spaces are large and light, including the main saloon with lounge seating and entertainment system. Lumiere features oak woods, honey-coloured onyx and marble for an elegant overall look. A separate dining area is home to a large glass table, with seating for 12. An identical table is located on sky lounge aft deck for al fresco meals. The sky lounge provides a relaxed environment with ample seating and features including a game table and pantry for easy service. The bridge is home to more seating for guests to relax in and take in the views while the yacht is underway. Like her interior, outdoor spaces are generous and includes the popular sun deck with its Jacuzzi, bar, covered living area and open air media lounge – perfect for cinema nights under the stars! Lumiere cruises at 16.5 knots with a range of 3800m and can reach maximum speeds of 18.5 knots. High-quality zero speed stabilisers ensure added comfort for her guests. 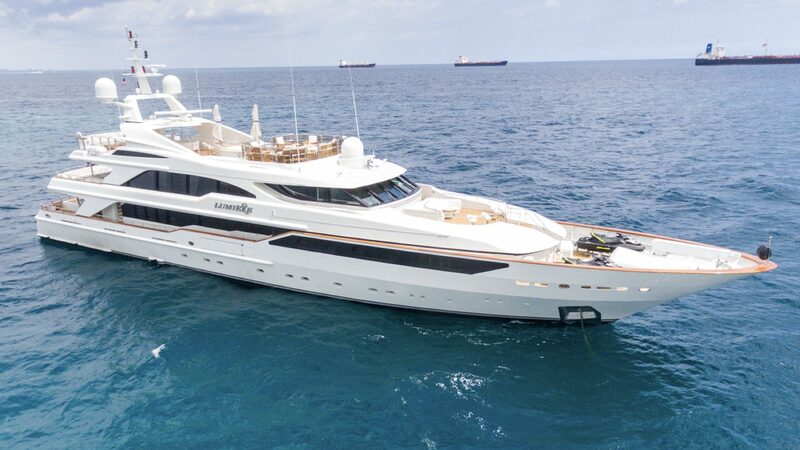 Packed with toys and tenders, her on-board inventory includes twin Novurania tenders, jet skis, SeaBobs, paddle boards, snorkeling equipment and much more. Designed to enjoy life on the water, she is a true entertainers’ yacht with many versatile social spaces, with a focus blending indoor and outdoor living.